of billions of events per day for more than 3,700 clients in over 130 countries. This report is based on the cyber security event data we collected between 1 April 2012 and 31 March 2013 in the course of monitoring client security devices as well as data derived from responding to and performing forensics on cyber security incidents. 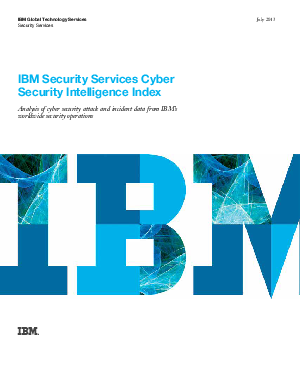 It is complementary to the IBM X-Force 2012 Trend and Risk Report. Since our client profiles can differ significantly across industries and company size, we have normalized the data for this report to describe an average client organization as having between 1,000 and 5,000 employees, with approximately 500 security devices deployed within its network.